Know how to cook pasta? It’s really, really easy! Here are a few tips to ensure the perfect result. How to cook pasta. It’s something that everybody (even the companies that make pasta!) takes for granted and automatically assumes everybody knows.I didn’t before I lived in Italy, even though it’s right there on the packet! Even if you do know how to cook pasta, have a quick scan of this page to see if there are any tips of interest to you. Firstly, they say a bad workman always blames his (or her) tools – this is only partly true. If the tools you have aren’t right for the job, the end result is unlikely to be as good as you expected. You should have a good assortment of pots and pans. You don’t need hundreds, but you should have at least one large deep pot (for cooking the pasta), a couple of medium sized pots (for cooking the sauce – some require you use two at once! ), a small to medium sized deep pot (in case you need to make a broth to add to sauce or a risotto dish) and a large, deep frying pan (for some dishes, it’s easier to add the pasta directly to the sauce in the pan, instead of mixing the two in another bowl). There are many large, deep pots specifically for boiling pasta, which come with a strainer insert – but if you’re new to Italian recipes, you may not even be aware of their existence. A colander will do just fine, but make sure the holes are not too big, otherwise your pasta will escape when you strain it! Tip (especially useful in the wintertime): before you strain your pasta in the sink, run the cold water to one side (and leave it running until you’ve finished straining) – this will prevent cold or frozen pipes from cracking when the boiling water hits them! Contrary to popular belief, you don’t test whether pasta is cooked or not by throwing it against the wall to see if it sticks! Perhaps the most important thing of all when your cooking pasta is a timer, this can be your wristwatch, your mobile phone or anything that makes a noise when the time’s up. Time is of the essence… especially when you’re cooking pasta! So? How do you cook the perfect pasta!?! You should always use a pan big enough to fully submerge the pasta you want to cook – if you think you’ve got the right size pan in mind, go one bigger… just to be on the safe side. Keep the heat high and add (roughly) 1 tablespoon of salt per liter of water. Tip: don’t add olive oil to your water as it’ll coat the pasta and the wonderful sauce you’ve made will slip off! Once your water’s boiling (really bubbling), add your pasta (make a note of the cooking time on the pack) and set your timer to that time. Tip: if you want ‘Al Dente’ pasta (which is great for fish based dishes, or pasta salads) set your timer to 1 minute less than that shown on the pack. When you add your pasta to the water, you may need to turn the heat down a little to prevent it boiling over. While your pasta is boiling, get the strainer ready and as soon as your timer goes off, strain the pasta. The trick is to get the pasta into the strainer without scalding yourself in the process – so don’t rush what your doing! 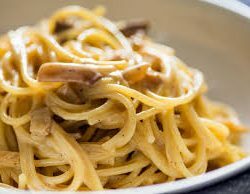 Tip: too many people over cook pasta, which just makes it much heavier and much more difficult to swallow (because it becomes gluey) and digest (because it doesn’t mix well with the sauce) keep to the cooking times on the pack and you can’t go wrong. Pasta all’uovo (fresh pasta with eggs) is easier still! You need to boil and salt the water as outlined above and when the water comes to the boil you add your pasta and turn down the heat. If you want to know how to cook commercial Pasta all’Uovo, be guided by the time stated on the pack. If you’re cooking freshly made pasta, after 2 or 3 minutes your pasta will start to rise to the surface – and when it does your pasta’s cooked! Tip: if you want to cook pasta to take to work with you, chances are you’ll cook it the night before or first thing in the morning. Because this pasta will stand for a few hours before you eat it, it will soak up more of the sauce it’s in. Cook it for two-thirds the time indicated on the pack, to make sure it isn’t too soft – i.e. if it says 12 minutes on the pack, cook it for 8. Now you know how to cook pasta!